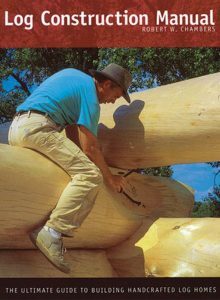 Rating: One overriding assumption for the following review is that chainsaw milling of lumber is inherently slower and less efficient than a portable band saw mill, but it is also a lot cheaper in terms of equipment purchase and maintenance. 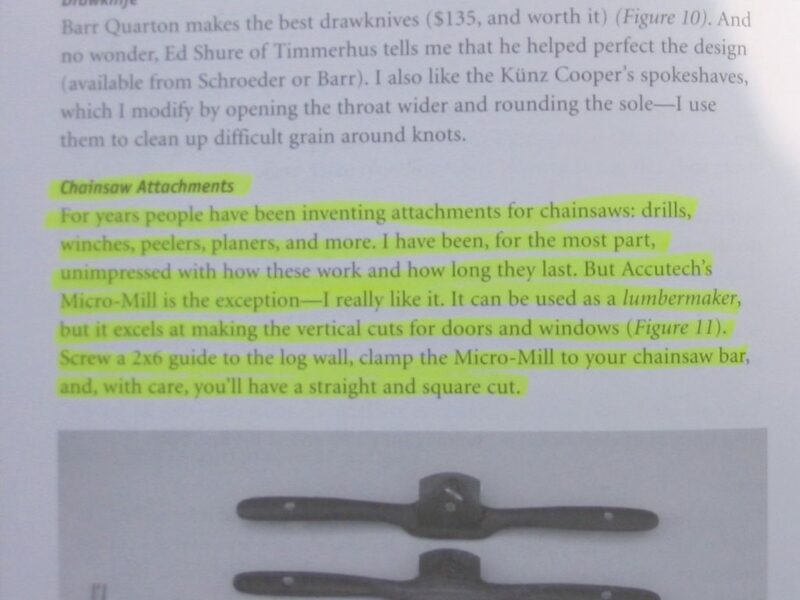 Using the AccutechMicro Mill, my wife and I spent few of months last summer milling about 250 9″ X 9″ timbers ranging from 8′ to 18′ long for a house. The logs were all insect killed, primarily lodgepolepine but also some spruce and dougfir. With a little practice got outstanding results both in terms of squarenessand straightness. I found set up through the entire milling process quicker and easier with the Micromillthan with the Alaskan mill I used briefly a few years ago, and the resulting beams are just as accurate. I also tried the Beam Machine for a few logs, threw it back in the truck box and went back to the Micro Mill. The Micro Mill may be more expensive but in my opinion this is a classic case of you get what you pay for. It is a precision made piece of equipment. When you consider felling, limbing, bucking, set up, milling and saw maintenance our production would average about 1 (8′) timber per hour. We have done as many as 13 in an 8 or 9 hour working day. Travel time, loading, hauling, unloading are in addition. We both qualify for AARP discounts. Our set up used a 2X6 for a guide rail and we had three different lengths -10′, 16′ and 20′. Life is a little easier if you use a guide rail a couple of feet longer than the log as it makes entering, and particularly exiting, the cut more accurate and less likely to put the tip of the bar into the dirt. 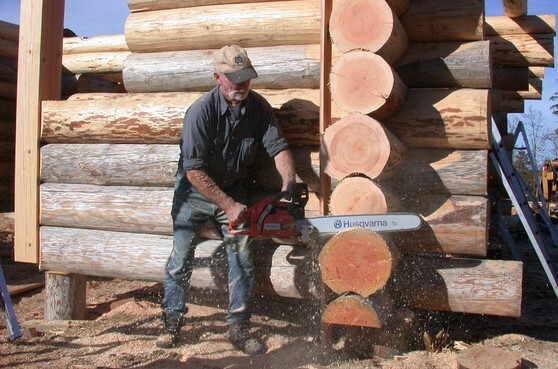 Our saw was a Stihl MS390 with a 20″ bar and we were cutting 12″ to 16″ logs. Rather than nails, we use long deck screws to attach the guide rail to the logs because one key to efficiency and quality in the end product is theguide rail set up. My wife uses a square and a level to set the guide rail level the whole length of the log for the initial cut. Thatis level across the 6″ dimension checked at several points down the log and adjusted by screwing in or out the deck screws, which are inserted in each edge of the 2 by 6. With this set up I can make cuts down both sides of the log without resetting the guide barif I want a 9″ dimension. Then roll the log 90 degrees, do one more set up and make both cuts to end up with a square timber. Wehave also milled cherry and oak cants in Maryland which will be the material for the cabinet and case work. In fact we originally bought the Micro Mill to do this after hurricane Isabel in 2003. My one criticism is that if you want different dimensions then you need to reset the guide rail after each cut. 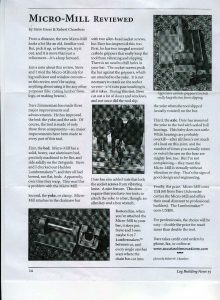 However this same issue exists with the Beam Machine and with slabbing guides onthe Alaskan Mill. We are experimenting with a solution to this this summer and will update the review if it is successful. Wehave another 200+ timbers to mill. 340 people found this review helpful. 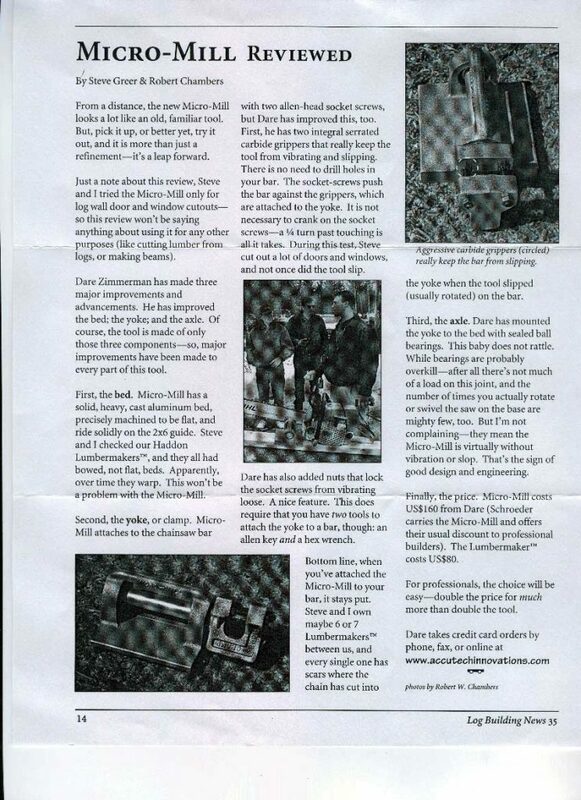 I have tried the micro mill on two houses, cutting window and door openings, triming wall ends and making flat cuts. It is, without question, the best I have ever used and, with proper saw maintenance and a well fitted guide board, it can produce an exceptional cut – use it on your next building. I’ve been milling timber with different chainsaw mills for over 20 years. I heard good things about the Micro Mill from a friend of mine so I borrowed it to mill some timber in the back 40 of my farm. The best thing about this Micro Mill is that I can clamp anywhere on the cutting bar. This allows me to adjust the cutting depth to suit the diameter of the log. Unlike other milling devices that require a special drill bit to drill mounting holes and once there drilled that’s where they stay. Once you have completed your first edge cut. Rotate the flat 90 degrees to the top and re-mount the guide board. This is where the Micro Mill boasts a huge advantage over other milling devices I’ve used. With the Micro Mill mounted on the guide board set the depth of cut so you do not cut all the way through the bottom of the log! 20 years of milling experience and this little mill has me excited! Why? 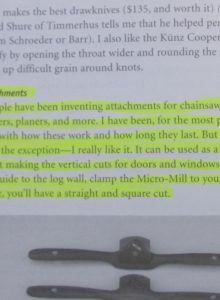 That simple innovation of being able to set your depth of cut changes the whole system of milling lumber with a chainsaw mill. Now, begin slabbing. Make your first cut along the length of the log, then move the guide board over the distance equal to the thickness of board you desire. A measuring tape helps keep the boards parallel. Continue slabbing cuts and moving the guide board in the same direction until you run out of wood to mount the guide board to. Rotate the Micro Mill 180 degrees and finish slabbing the remainder of the log moving the guide board in the opposite direction. Note: you may have to mount the guide board to the area that was just slabbed. This technique allows you to rotate the log one last time and begin parting off your dimensional lumber. The Micro Mills concept is similar to other milling devices like the Haddon Lumbermaker and the Beam Machine but unfortunately they both lack the ability to set the depth of cut. 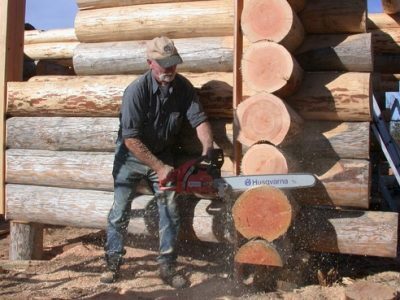 Even the Alaskan Mill requires the purchase of a second Mini Mill to part off dimensional lumber, which becomes very complicated and costly. My friend received his Micro Mill fully assembled and ready to go to work. The Micro Mill’s key feature is the clamping system, which uses serrated tungsten carbide grippers to bite into the hardened metal of the cutting bar. 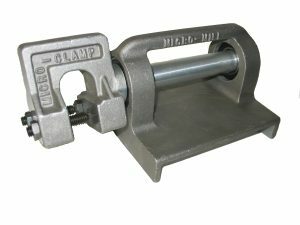 The clamp is securely held in place and swivels on two sealed precision bearings. There is absolutely no play in this mill! I like the fact that this design kept what proved to work in the past and combined it with space age materials and technology. The Micro Mill is very well built and robust. The winner hands down.